This is about getting the start "good enough". 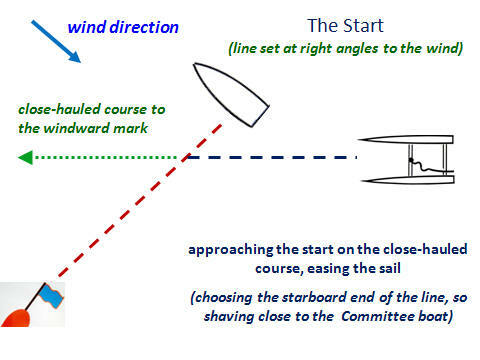 The diagram below shows the usual position---a start line set at right angles to the wind, with the Committee boat at the starboard end. The sail is eased to slow down, sheeting in in the last seconds and yards to cross the line going at full speed ideally. Other boats will complicate this picture (see in more detail, to follow). 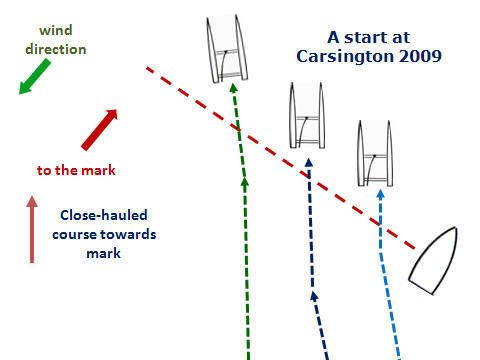 TV of the Olympics shows a line of boats hovering almost motionless a yard or two from the line. This is much harder than coming in slowly, and not needed in the smaller Catapult fleets! 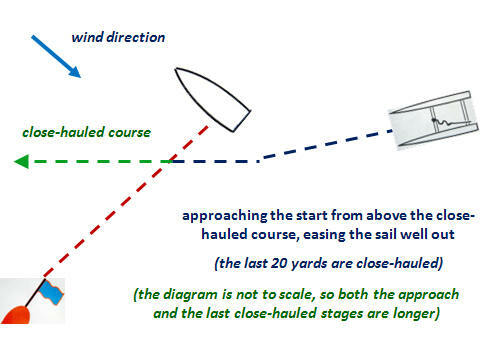 In heavier weather, this is more difficult, as gusts or shifts will push the boat suddenly forward, or else waves and wind will push to leeward below the close-hauled line. Starting a longer way out from the line gives time to adjust. The three boats have come over the line together and should have an equal chance. 522 has borne off slightly for speed and to be a bit clear of the others, while 513 and 17 are probably watching each other too closely rather than concentrating on their own boat speed. They have no immediate tactical decisions (as they have the starboard end of the line and starboard right of way) so boat speed is the priority.